Back to the Giardino dei Semplice today with a photograph full of lovely contrasts. The sun was out and it was a lovely warm morning as we walked around the gardens, however, the sky swiftly darkened, lightning flashed, thunder rumbled and we hid under a group of trees while the rain splashed for a while. 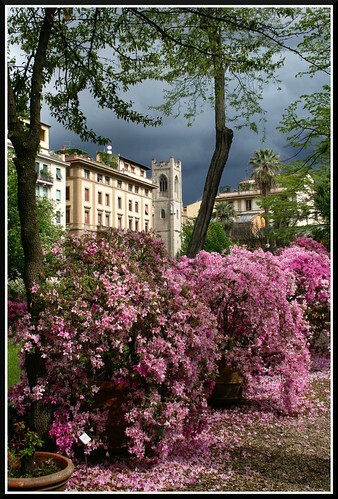 It was difficult to capture the intensity of the dark thunder cloud against the still bright buildings and flowers. I've now got just Monday left at school before the glorious summer holidays begin! We're heading up to Northumberland next week and I can't wait! R gets to do the introductions and tour guiding this time! Another stunning picture Laura, keep em coming!